Only two days are left for Apple March 2 event and whole world knows what this event is all about, Yes it’s all about Apple iPad 2, successor of Apple’s most successful iPad. Numerous rumors about Apple iPad 2 has been published speculating its specifications and we know Apple fan boys loves to keep track of these rumors hence we decided put our best guess on these rumored specs about Apple iPad 2 at one place along with our expectations of turning into reality. Many suggesting Apple iPad 2 is incremental upgrade rather than complete rework, something similar to what Apple did from iPhone 3G to iPhone 3GS and its high chances that Apple is attempting to make iPad perfect to keep it competitive with rest of tablets launched or will be launching in 2011. Without further ado let me present you the our Apple iPad 2 Specs list. 1. iPad 2 Resolution – Initial rounds of rumors suggested bump in iPad 2 resolution with some even calming 1080i HD video support, but second round of rumors suggest same resolution as iPad 1 but with retina display. 3. iPad 2 Processor: iPad 2 should come with much better processing power and advance version A4 processor i.e A5 should make to iPad 2 specs list. 4. Camera Back & Front Facing – front facing camera doesn’t need any justification as many have speculated Facetime calling on iPad 2 but back camera making its way to Specifications list doesn’t look to as happing with iPad 2. 6. iPad 2 Capacity – We suspect Apple will follow its traditional 16, 32, 64GB model and iPad 2 should come with these capacities. 8. Input & Output : the general I/O device of iPad will be in iPad 2 but we don’t accept the rumors about external SD card slot support. 9. No Home Button – There was rumor about Apple working on iPhone & iPad without home button. But we feel iPad 2 will be lot like iPad 1 and will definitely come with home button. Other specifications like TV and video out, Audio playback shouldn’t change much from iPad to Apple iPad 2. That is our best guess for Apple iPad 2 Specs and we hope Apple will launch iPad 2 more or less based on above specifications. 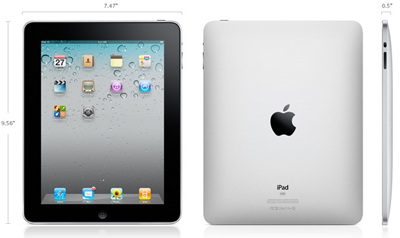 So stay tuned with us for Apple iPad 2 March 2 event and see how much we are correct at iPad 2 specs list.